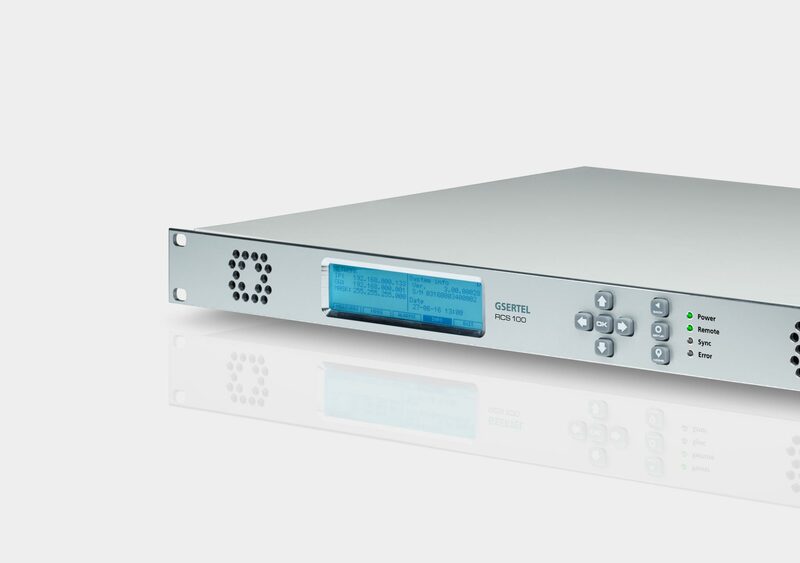 Gsertel’s RCS 100 DVB-T/T2 is a network professional monitoring platform that allows the remote, proactive and real-time DVB-T/T2 digital television signal monitoring, both at RF and transport levels. With a compact format, 1RU, all the processing and analysis necessary to obtain the monitoring results is done on the equipment, not needing any additional element except a standard web browser to display the information. 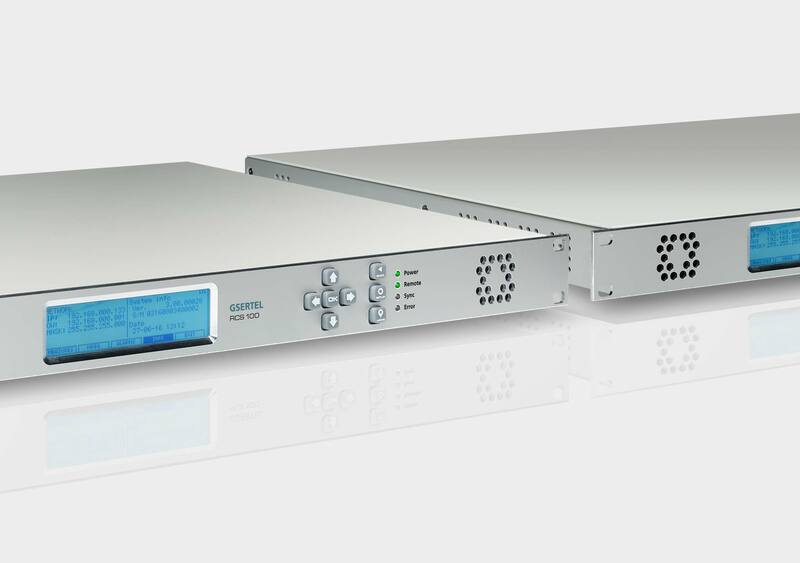 RCS 100 is designed for a 24x7 monitoring signal, allowing to ensure the availability of services in a DVB-T/T2 network. 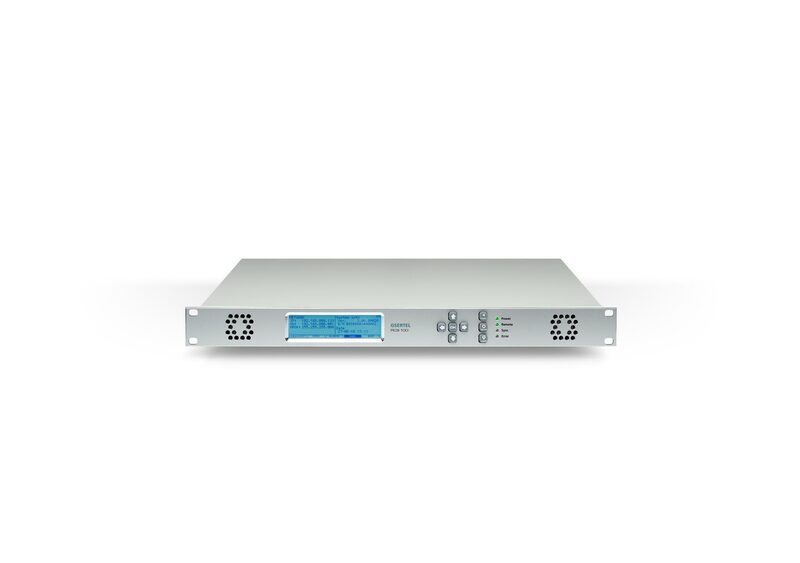 The intuitive web interface of the RCS, which allows an easy and quick access to all functions, coupled with unique features such as the powerful spectral analysis and capabilities of streaming or Transport Stream recording make the RCS 100 an ideal solution for headend monitoring, transmission sites or locations on the field. Signal inputs: 1 x RF N50Ω, 1 x ASI BNC 75 Ω, 1 x IP GE RFJ45 (up to 4 TS IP), 1 x (Backup) GE RJ45. Signal outputs: 1 x ASI BNC 75 Ω.
Synchronism: 1 PPS, 10 MHz. Ethernet (FE) port for management. Signal quality measures: Power, C/N, MER, BER, shoulders. Analysis by channel or multiple channels polling. Alarm log (real time) and representation (temporal evolution). Detailed bitrate of all services. Analysis of the table repetition. Video streaming up to 5 simultaneous destinations. 1st, 2nd and 3rd priority alarms according to TR 101 290 standard. 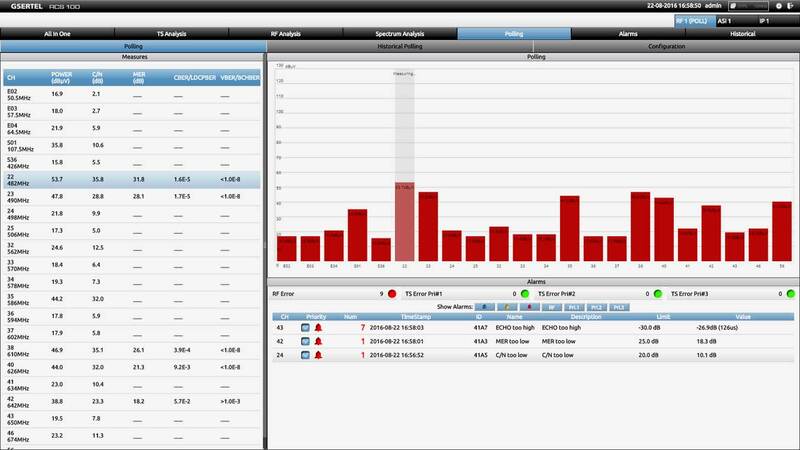 All the channel analysis and measurement information summarized at a glance. Constellation representation including pilot carriers and TPS. Real-time representation and temporal evolution of the RF measurements and alarms. Simultaneous and real-time processing of all inputs (300 Mbps maximum). 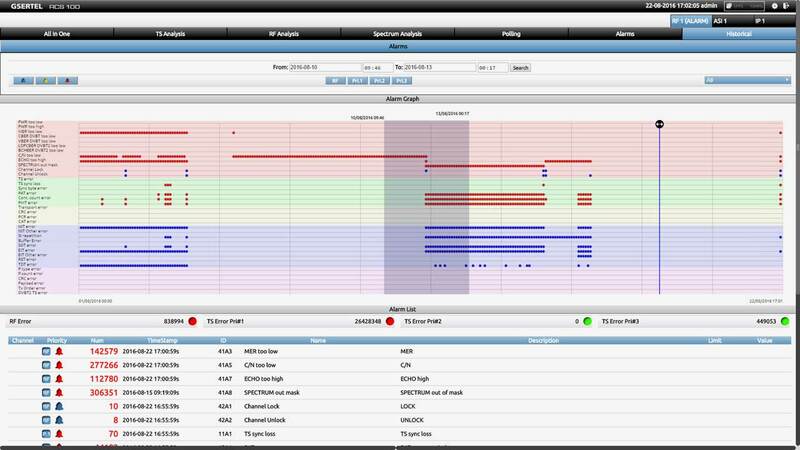 “All in One” screen that allows analyzing at a glance the status of a channel from several points of view: radiofrequency, transport and alarms. T2-MI analysis. Advanced measure of echoes, with masks in amplitude and delay. Full band spectrum analyser (5Hz-1GHz) with mask function and automatic alarm. SFN (DVB-T and DVB-T2) drift measurement. Accurate measurement (<10 Hz) of the frequency Offset. Measurement and temporal representation of the PCR Jitter. Measurement and temporal representation of the network delay. Powerful historical analysis of measurement and analysis of alarms. TS manual recording and triggered by alarms. 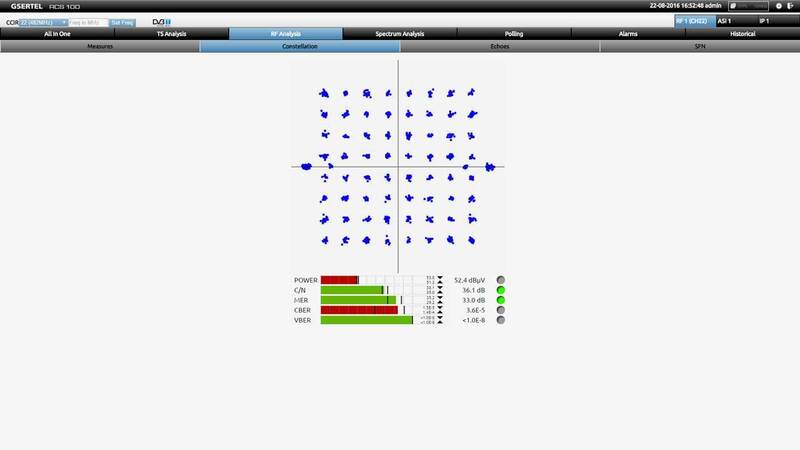 Remote control application in HTML5. 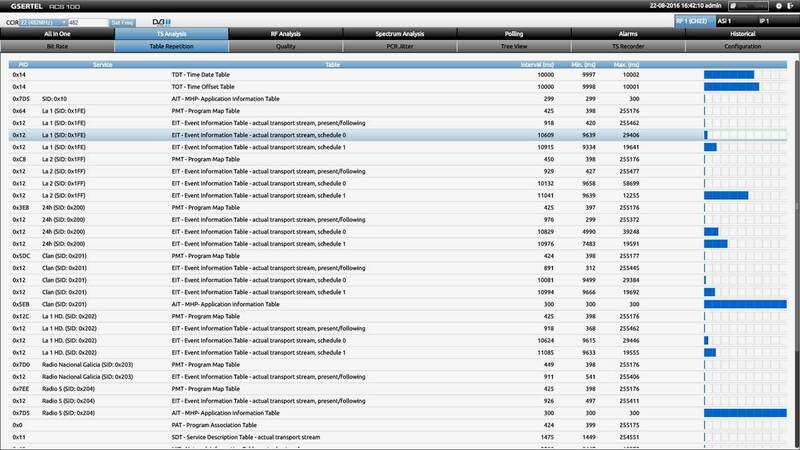 Inf shows in detail channel services inforamtion. Several views are configurable. Tool for intuitive search and historical analysis of alarms and measurements. Automatic measurement of multiple channels over an input. Proactive detection of signal problems. 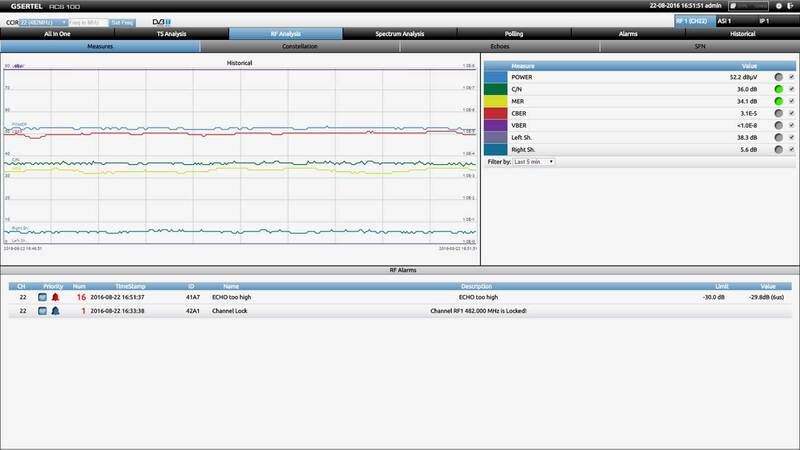 Time reduction in distribution and transmission network diagnostic and troubleshooting. 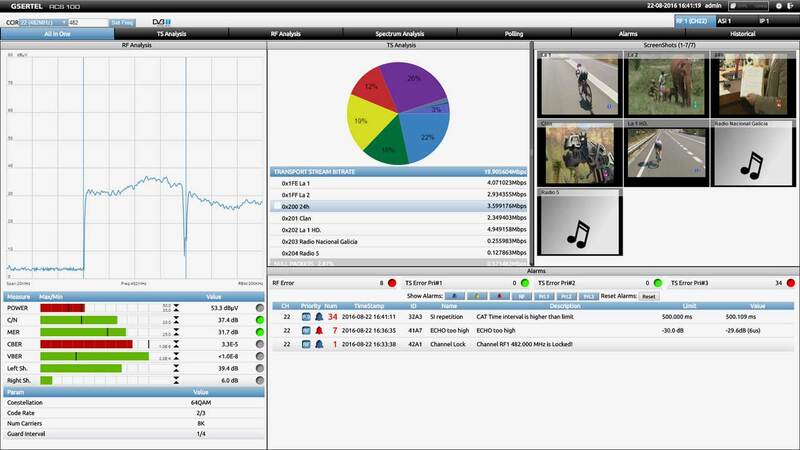 Attractive cost-benefit solution for the signal in-depth analysis. Very intuitive and user friendly interface. Flexible and scalable in functionality architecture (software licenses). Full integration with third parties’ NMS. Availability of the latest features through the automatic detection of new software versions. I have read and accept the terms and conditions as they refer to data protection and I consent to the treatment of my personal data. 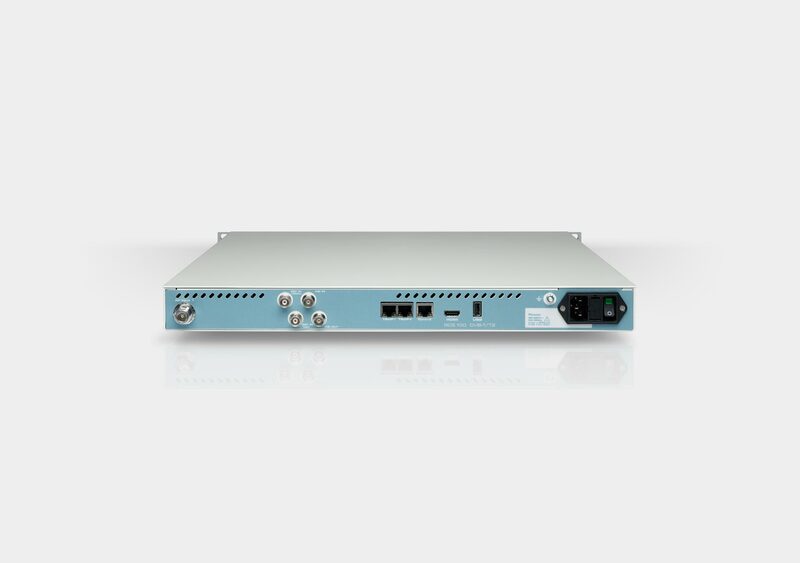 If you already have the login information to our RCS 100 DVB-T/T2 Live Demo, click the link below and login with your user and password.